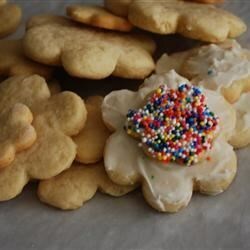 "These are deliciously soft moist sugar cookies with the creamy richness of Bailey's Irish Cream! Wonderful as a St. Patrick's day treat or for any day you're craving a sugar cookie. I brought these to a party and within minutes, they disappeared. Feel free to omit the Bailey's and just cut down the flour by about half a cup." Cream together butter and sugar until fluffy. Beat in vanilla and egg yolk until combined, then beat in egg; beat until smooth. Pour in Irish cream, and beat until incorporated. Preheat oven to 350 degrees F (175 degrees C). Line two baking sheets with parchment paper. Roll dough out to 1/4 inch thickness on a floured work surface. Cut into shapes using cookie cutters and place onto prepared baking sheets. Added a bit extra Irish Cream, personal preferance, and they came out Wonderfully!